Many people struggle to kill the weeds in their lawns and gardens for the reason that they do not want to use a commercially made chemical herbicide. The safety of using these commercially available weed killers is not entirely known. While the manufacturers and even government agencies say they are safe the long term affects of the continued use of these toxic chemicals and their affects on people and other living creatures is not entirely known. For those of us who do not want our children and pets exposed to these toxic chemicals trying to find a way to kill the weeds overgrowing our drives and gardens can be tough. What many people do not realize is that there are many non-toxic ways to kill weeds right around their home. - 1 litre of white vinegar. - 60 grammes of table salt. - 1 squirt of washing up liquid. Mix everything together making sure the salt is completely dissolved. You can then pour this into a spray bottle or one of those weed sprayers you can get at any garden center. You spray this solution directly on the weeds you want to get rid of preferably on a hot day in full sun for best results. One thing to remember with this solution is to not get it on anything you don't want to kill.It is non-selective in what it kills meaning it will kill any plant life it comes in contact with and it will sterilize the soil for up to two years depending on how much you get on the soil. Please pay particular attention to this, the salt in the solution is what makes the soil uninhabitable for weed seedlings which are still to come. If you wish to effectively poison your soil to new sowings and plantings for approx two years, then add the the salt element, if not omit it. So with salt is best for patios, gravel drive etc, basically all areas designed to be free of growth, whereas without salt is better for beds, borders, lawns and veg areas, where you intend to plant again. 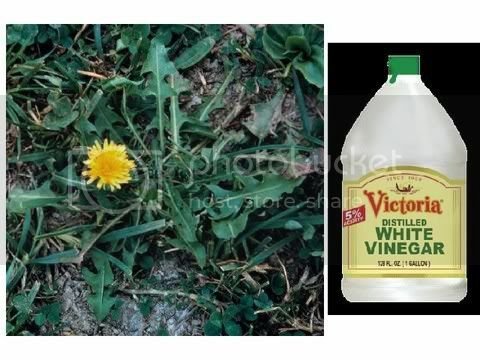 If you are concerned about getting the vinegar solution on your desirable plants you can use a cloth to wipe the solution on the leafy parts of the weeds. This will keep any of the solution from coming in contact with the plants you want to keep. If you use this method it is advisable to wear rubber gloves to protect your hands from the acidic affects of the vinegar. If you don't want to use this formula for a homemade weed killer then you can always rely on the tried and true method of hand-pulling any weeds you find in your landscape. Eventually the weeds lose the ability to create enough food for their roots to continue to grow and their roots will die off. This actually works best if you don't have a lot of weeds in your drive or garden. The nice thing about using a bio-degradable homemade weed killer is that you are not harming your family and pets which can happen with the commercially available weed killers on the market today. DISCLAIMER: The control methods are suggested here as a matter of general information. Under Irish and EU law it is illegal to use any preparation as a pesticide/fugicide/herbicide that is not approved for such use. The author and the website accepts no responsibility for how a user may mix, use, store, or any effects the mixture or its elements may have on people, plants or the environment. The information here is for reference only and does not imply a recommendation for use. If you disregard this warning and make any of the preparations, you do so entirely at your own risk. Hi GPI , I recommended this organic weedkiller to someone else on this site, but as I mentioned there I have never actually used it myself , so I have no idea if it actually works . Have you tried it yourself ? I will raid the larder when Mrs. Bugs is out and maybe try it myself ! Yes Bugs, it's effective alright, but sunny weather is required to get a good kill. You suggested it to me, Bugs, and I did try it, though not with the salt and soap. The plain vinegar did, indeed, kill the foliage, but I'm not so sure about the roots. Time will tell. I'll mix up some with the other ingredients and see how that does. I'm only guessing here , but I would imagine that the vineger will kill the green growth and the salt will stop regrowth . So it would be OK to use on a driveway but not where crops are grown . The soap is just used a wetting agent to allow the vineger and salt adhere to the plants . Makes sense. I'd like to not think of having to mow my driveway or bring in more loads of gravel right away. The road crews use a lot of salt and other melting chemicals on the roads when there's ice in the winter and that doesn't seem to bother plant growth along the roads too much. Maybe it would if they got a steady diet of it, though. Has anyone tried this? I'm just wondering if anyone can confirm if this recipe will kill the weed completly i.e. roots and all. I have found it great for annual weeds crosseyedsheep, such as shepards purse and the like. But when it comes to perennial weeds with deep roots such as dandelions, it will just kill the top growth. After a while the dandelion will regrow from its roots. But when it comes to perennial weeds with deep roots such as dandelions, it will just kill the top growth. After a while the dandelion will regrow from its roots. it seems the original post in this thread has been posted several times in other places since!